Ved siden av den vakreste sandstrand på sørkysten av Tinos Island, denne romslige tradisjonell stil, moderne villa på to nivåer, har to bad, smakfullt innredede rom, fullt utstyrt kjøkken, takvifter, Klimaanlegg, Wi- Fi og absolutt komfort for 6 personer. Fra den store terrassen kan du oppleve de mest fantastiske Aegean havsutsikt med øyene Mykonos, Delos og Syros i bakgrunnen. Villaen er bygget i tradisjonell stil med stein og terrakotta funksjoner, og har en stor pergola med klatreplanter og blomster, som gir verdifull skygge fra den sterke greske solen. - Den romslige stuen har tradisjonelle tretak og et hjørne peis. Det er smakfullt møblert med møbler i kykladisk stil og dekorert med greske seascape malerier som understreker den autentiske karakter av villaen. - Hvert soverom ligger i tilknytning til et fullt utstyrt bad og store (40m2) soverom kan deles inn i to seksjoner for mer privatliv. Den lange sandstrand (350m) ligger kun 5 minutters gange, som er nærmeste kafé og restaurant. Det er en av de vakreste strendene på øya, som strekker seg mer enn 1 km og er grunt og trygt for barn. Tinos by (5 km) er mindre enn 10 minutters kjøring og er full av liv med mange restauranter, shoppinggater, middelalderske brosteinsbelagte gater, tradisjonelle kafeer, barer og rikelig med uteliv for alle aldre. Bussturer rundt øya, samt båtturer til øyene Andros, Syros, Mykonos, Delos, Paros Naxos og Santorini er tilgjengelig på daglig basis herfra. Denne romslige gresk villa med fantastisk panoramautsikt, nær stranden og nær alle fasiliteter, ville være det ideelle stedet for en uforglemmelig ferie på øya Tinos. The Aegean øya som har bevart den autentiske kultur og tradisjonelle skikker i Kykladene og tilbud til besøkende en ekte smak av Hellas. We thoroughly enjoyed our stay in this little villa, which is beautifully presented, immaculately clean and well equipped. 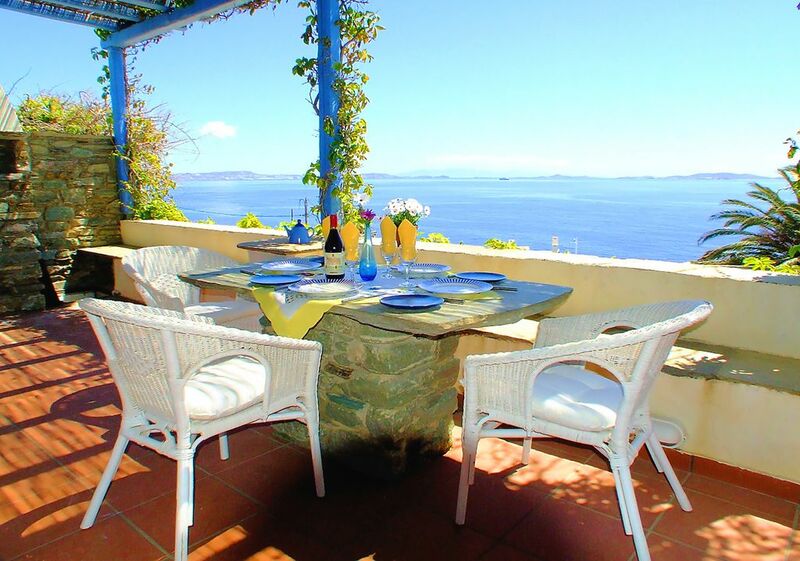 The terrace has a lovely view of the ocean and is an ideal spot for eating or reading. The location is very quiet but in easy walking distance of a lovely beach which is perfect for swimming. We found 4 good places to eat all within walking distance and set back from the beach. Our favourite was the Byzantio restaurant which also has a beach bar, great quality food and friendly service. It’s possible to walk into Tinos town by following the unmade coast road and path, it takes around 45 mins to reach the Agios Fokas beach area on the outskirts of town, which also has 2 really good places to eat: Marathia Tavern and San to Alati. Communications from Louise, Jenny and Babis were excellent and we were very well looked after. If you are looking for a place to relax and unwind but still have the opportunity to eat out this is the perfect place and Tinos is a fabulously unspoilt little island well worth exploring. Many thanks for your lovely review. We are delighted you had a good holiday and look forward to the pleasure of welcoming you again in one of your future trips. It was very clean and convenient with a gorgeous view. Louise was so very helpful in helping us to finalize our plans with the ferry and rental car. I highly recommend it and would definitely stay there again the next time I come to Tinos. Thank you for your lovely comments. We are delighted you had such a good time and look forward to welcome you again to the beautiful Island of Tinos. Excellent accommodations and location. Tinos is a remarkably island. Owner and her friends, Jenny and Botis are the best. They add insurmountable benefit to a great property in a wonderful island in Greece. Thank you for your lovely comments. We are delighted you have enjoyed your stay in the beautiful Island of Tinos and look forward to welcome again in one of your future trips. We had a great time in Tinos. We arrived on a late ferry, and the caretaker Roxanne's husband met us at the port, guided us to our rental car, and led us to the home. We were so excited as we drove up to find such an iconic Greek look and feel and bougainvillea climbing up the porch. The home was just as advertised inside and out. The view was fantastic. The home was perfectly set up for our family of parents and 3 grown daughters. Our girls stayed downstairs together in the large bedroom with bathroom. We all had plenty of space and privacy. There is a very nice sandy beach within a 5 - 10 minute walk. There is some natural shade on the beach, but you must get there early in order to claim it. You can also rent chairs and umbrellas at the far end of the beach for only 5 euro/day. There is also a taverna. The water is beautiful and clear, and you don't have to worry about rocks. Although closer to the house there is an access to the water from an enormous rock landing that was fun to visit. We really enjoyed the mix of beach and Greek culture. There are quite a few traditional Greek villages within 10-60 minutes of the house. We spent several mornings exploring the area followed by lunch in a village cafe and relaxing afternoons on the beach. Note that some of the other beaches on the island are much rockier. We also spent time in Tinos Town. The church is a main focus in town. You can see people crawling up the hill to the church on their knees in reverence. We also took a tour of the local Brewery, and spent a day in Mikonos which is only a 30 minute ferry ride away. Here are few tips about the house that may come in handy. First, the door latches when it is shut, and even if it isn't locked, you can't get back in because there isn't a knob to turn. I suggest you hide a key or come up with some other fix for this first thing. We made it through about 5 days before locking ourselves out. Roxanne's husband rescued us by zipping over on his moped and letting us back in. Second, although the home provides linens, there weren't any towels to take to the beach. We purchased Turkish towels in town. (If you choose this route, be aware that prices vary widely. We found some starting at 7.50 euro.) Third, after several showers, the bathroom floor gets wet. I was very glad to have brought flip flops. I highly recommend this home for a nice relaxing or active trip to Greece. We loved spending our time on Tinos. Una esperienza indimenticabile - an unforgettable experience! La casa si trova in una posizione incantevole, su una collina a 100 mt dal mare e da una delle spiagge più belle dell'isola, Agios Sostis. L'abitazione è pulita, nuova, confortevole, fresca, completamente equipaggiata come descritto nel sito, arredata con gusto, e possiede un terrazzo ampio, coperto da un fresco pergolato e riparato dal vento, rivolto a sud, con una vista eccezionale sul tratto di mare che separa Tinos da Mykonos e Delos. Nelle notti del nostro soggiorno, la luna si rifletteva magicamente nel mare! L'assistenza fornita dalla proprietaria Louise e dalla sua collaboratrice Roxanne è stata impeccabile, veloce e completa di informazioni e dettagli in tutti gli aspetti del soggiorno. Abbiamo avuto tantissime informazioni via mail che ci hanno aiutato nell'organizzazione. In particolare noi siamo atterrati a Mykonos, abbiamo preso un taxi fino al porto, abbiamo acquistato on line i biglietti del ferry e poi noleggiato un'auto che ci è stata consegnata al porto di Tinos. La casa si trova vicinissima alle spiagge, ma per poter sfruttare appieno la vacanza sull'isola (che è grande) suggeriamo di affittare una macchina (preferibilmente 4x4). Noi abbiamo affittato presso Dimitris rent a car (tramite mail dimitrisrentacar@gmail.com) in modo veloce, sono stati disponibili in ogni aspetto e ci hanno fornito un mezzo efficiente, che ci è stato consegnato al nostro arrivo appena sbarcati. L'isola di Tinos è un gioiello di pulizia, ordine, offre tantissime opportunità balneari e turistiche. Le spiagge sono bellissime, tutte con acqua cristallina, pulitissime; ce ne sono molte attrezzate con ombrelloni e servizi ma anche altre più selvagge e ugualmente belle. I toni sono entusiastici perché è rara la coincidenza di così tanti aspetti positivi, non ultimo il clima: caldo, asciutto e ventilato come spesso nelle Cicladi. Il vento è una presenza costante e notevole, al punto che bisogna fare attenzione a scegliere le spiagge più riparate nelle giornate più ventose. Meglio chiedere consiglio ai locali. Nota sul vento: quasi tutte le abitazioni hanno una terrazza, ma nei giorni di forte vento non tutte le terrazze sono praticabili; quella di questa casa lo è.
I paesi dell'entroterra sono meravigliosi e pieni di storia. La gente è gentile, disponibile e ansiosa di aiutare e consigliare i turisti. I ristoranti sono ottimi e offrono piatti locali preparati con ingredienti assolutamente genuini. Gorgeous views, beautiful villa and lovely island! We thoroughly enjoyed our stay at this lovely villa in Tinos. We were welcomed by Roxanne at the ferry who explained all the ins and outs of the home. We were walking distance to one of the best beaches on the island where we spent a good deal of time. The island has so much to offer so do tour around to all of the villages. Food was excellent everywhere we went! We loved it and hope to return! Villaen ligger ved en av de vakreste sandstrendene på sørsida av Tinos Island. Det har en ideell beliggenhet i nærheten hoteller og restauranter, bare en kort kjøretur fra Tinos. Storslått utsikt over Mykonos, kan Delos og Syros, nytes fra den store Sør-orientert Terrace. Fersk fisk og tradisjonelle greske retter serveres i den nærliggende restauranter. Fersk brød og bakverk er tilgjengelig på det lokale bakeriet hver morgen. Sun-solsenger og parasoller kan leies på stranden. Tinos by er full av liv med mange restauranter, handlegater, asfalterte middelalderske smug, tradisjonelle kafeer, barer, og mange uteliv for alle aldersgrupper. Bortsett fra den imponerende katedralen og Cultural Centre i Tinos by, marmor-kunstmuseet i Pyrgos, den gamle ursulinerkloster i Loutra, skulpturutstilling og folklore museer i landsbyene er vel verdt et besøk. Populære sommerfestivaler på hovedtorget i landsbyene tilbyr tradisjonell musikk, vin og dans, der alle er velkommen. Bussturer rundt øya samt båtturer til øyene Andros, Syros, Mykonos, Delos, Paros Naxos og Santorini, er tilgjengelige på daglig basis.